The Harmar Multi-Fold Safety Ramp is easily moved in one or two lightweight components due to its revolutionary patent pending design. When not in use, the ramps fold three times into a compact unit, making carrying and storage a breeze. The Harmar AR300 Multi-Fold Safety Ramp is easily moved in one or two lightweight components due to its revolutionary patent pending design. The ramp can be separated into two pieces for easy carrying with no extra pieces to be lost or misplaced; each piece folds in half to be carried like a suitcase. 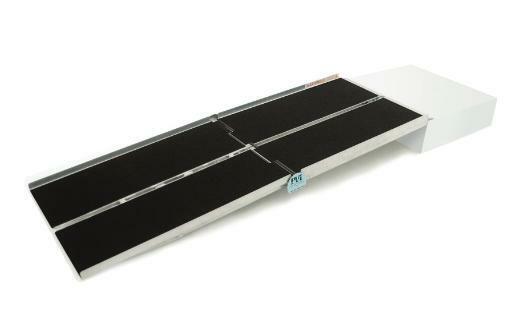 6' Multi-Fold Ramp; Anti-slip High Traction Surface 35 lbs. 7' Multi-Fold Ramp; Anti-slip High Traction Surface 39 lbs. 8' Multi-Fold Ramp; Anti-slip High Traction Surface 52 lbs. 10' Multi-Fold Ramp; Anti-slip High Traction Surface 63 lbs. 12' Multi-Fold Ramp; Anti-slip High Traction Surface 73 lbs.